Ten antique petal bells, cleaned and polished, on a dark brown lined strap. 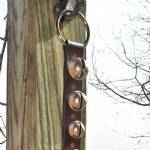 The two layers of leather are fastened together with small brass rivets between each pair of bells. This riveted style is an alternative to the laced style of strap I often make.